In recent times we have witnessed a shift in the political and social climate of our nation. Growing sentiments on social issues and policy culminated with the election of Donald Trump and since then the rhetoric surrounding controversies has changed, and not for the better. Immigration is one of several of these issues that are on the current forefront of the American mind. Deferred Action for Childhood Arrivals, or DACA, has been an American institution since it was signed into law by President Obama in 2012. DACA was established as a way for pressure to be taken off of low-priority illegal immigrants, we know these illegal immigrants as children. The policy was instituted so that children who were brought to the United States before their sixteenth birthday could remain here under a renewable two year period of deferred deportation. DACA was instituted primarily to aid children of immigrant parents as they completed their educations, being in school is one of the many requirements to receive DACA. Currently there are about 800,000 DACA recipients in the United States. Obtaining this provision is no small task: Recipients have to reapply every two years and pay a fee of $500 among a long list of other criteria in order to obtain deferred action. Contrary to some common beliefs, DACA is not just handed out on a silver platter; it is an arduous process that requires steady commitment and drive to strive for better. In September of this year, the Trump administration announced that DACA would be rescinded. This announcement has come with mixed reception, outcry, and a general concern with the status of stability in the United States. The department of Homeland Security repealed DACA and the administration has since left Congress to rework it within the next six months. In the meantime, a memo from “The Department of Homeland Security urges DACA recipients to use the time remaining on their work authorizations to prepare for and arrange their departure from the United States.” Demonstrations and public displays of disapproval have been voiced in urban areas like New York and Chicago, but what about North Park? Mayor Rahm Emanuel had said before that he wants to make Chicago the most immigrant friendly city in the nation. Chicago has a history of being a sanctuary city, a place of refuge for the masses of immigrants and refugees around the world. The city’s unique stance on immigration policy makes for an interesting climate with no shortage of controversy and activism. North Park University has always claimed a title of global acceptance and outreach. With our location within the city of Chicago, and more specifically the Albany Park neighborhood which is known as one of the most diverse areas in the nation, we are smack in the middle of the debate on immigration and DACA, and we have the exclusive privilege of witnessing just how national politics affect local people. 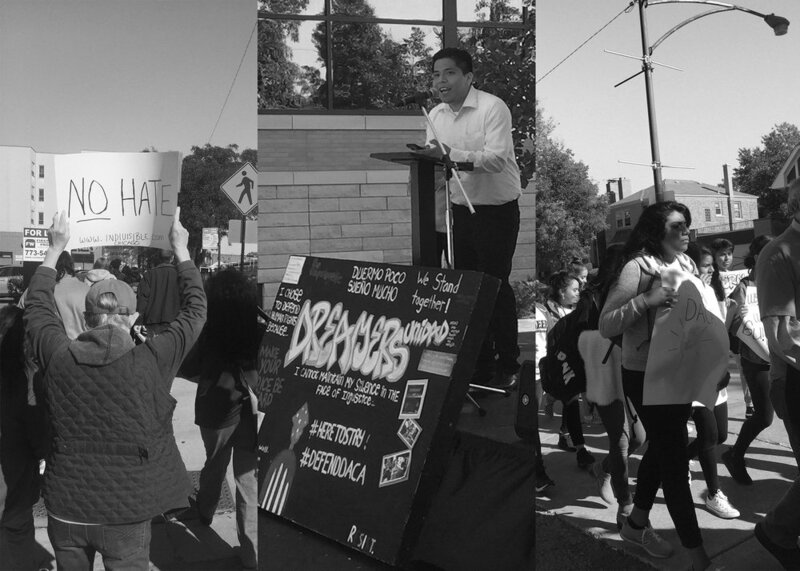 The success of the Justice Rally was a great way for the community to spread our vision of acceptance and activism, but it is only a small step in the greater conversation surrounding DACA and immigration. By being a proponent of the national dialogue, each and every one of us an be an ally in the fight against dehumanization, we are all called to be safe havens. Let us fulfill our task. ← Does Campus Diversity Affect Student Success?